This picture will stop all rumors about the son of President Michel Martelly, Olivier Martelly as several news sources has recently reported that he was in trouble with the American justice and consequently has been arrested. 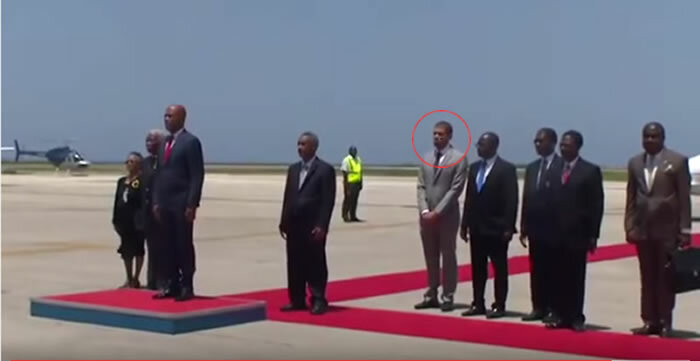 Recently on September 5, 2015, Olivier Martelly, the son of Haitian President Michel Martelly was noticed arriving at Montigo Bay airport in Jamaica accompanying his father who came to attend PetroCaribe conference in the city. There were reports that he has been held in the U.S under house arrest in charges of money laundering, tax evasion and narcotic trafficking from Colombia via Haiti to the U.S. The picture of his arrival in Jamaica might put an end to the rumor of his arrest, but it will definitely generate more questions with his underworld connections and freedom.